Later, Mason thought that perhaps his paintings showed all sorts of moments. He recognized the coffee cup in Starbucks that he picked up by mistake and the brush of someone’s fingers against his hand. He saw his painting spread across the street when he walked to work, cramming a bagel into his mouth and leaning on the ache in his shins like any morning. Then, of course, he burned himself on his coffee and sighed with the pain and the stain spreading. He tripped over the sore stiffness in his legs and hit someone’s face with his elbow. The hospital bills and the apologies spilled out after. He began with an ordinary moment, but the painting didn’t show him the hurt that colored it. When Mason was working, and his brush dabbed and smudged the world together, he couldn’t feel it at all. There had been no heartbreak in the oily light of the yellow moon. When he squinted his eyes to watch the coffee cup take shape, he didn’t have any sense of the spill, of the heat searing his flesh, of the warmth in his cheeks as all thirty people crammed into Starbucks turned to watch him curl in pain and swear like a stained sailor. That only happened in the moment. All he could do was watch it turn into something he hadn’t expected, hadn’t meant to draw and paint and smudge into being. He kept painting at least once a week, for a while. For months, even. Mason painted the next man, and the one after that, and when he met them he recognized the strokes of their faces from the lines his hand made with the long straight handle of the brush. Afterwards their paintings stayed in his closet, facing the wall. They were easier, hidden away. He painted getting “let go” at work and the stumbling stutters of three job interviews all in a row after that. He painted a night so steeped in whiskey that the canvas nearly oozed its acrid stink. He only assumed, later, that the shapes on that canvas had happened to him at all. He didn’t recognize the faces or the street. He barely remembered that night at all, except that he’d painted it, so it must have happened. When his paintings came to pass, it was always in a way he didn’t expect. He’d thought, in a vague hopeful way, that perhaps he was getting a promotion. When he finally got a new job, he had never painted that congratulatory call. He smiled at a new coworker, but his brush never traced the answering grin. His canvases stretched from one tragedy to the next, big and small. There was one canvas that ended up with Alan’s face on it. Mason hoped, with a painful twist in his breath just to think it, that it meant they would see each other again. He realized, eventually, that it must have been his tragedy that happened without him. After a long while painting, he recognized the pattern. His dreams started bring him to his studio and to tell him to paint a car crash, his mother in a doctor’s office, Alan’s death. Mason put his canvases away. Now he waits to see what the future looks like. He doesn’t paint anymore. He couldn’t find himself in the painting. Mason knew he was there. He’d felt the shapes of his head and his shoulders somewhere, and he felt the curve of the light slipping against his skin in the tender smudge of yellow. It could have been anywhere though, anywhere tucked into the details of the trees and the buildings. 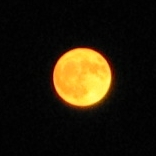 He’d painted a slow yellow moon precarious on the horizon, fat and round against the deep blue-black of the sky. When he looked at the painting, he tried to look for himself. The moon kept pulling his gaze back, though. It almost shone from the canvas. Sometimes he was amazed at the light that came from the smeared shapes of oil and pigment. There – maybe he was there, in the corner. What was he doing? Mason squinted, leaned, and smiled. There he was, definitely. Now that he’d found it, it seemed obvious. The light trickling down the side of his neck was a ridge standing out from the painting. It would be bumpy and hard when it dried. He – the him in the painting, the little one – was curled against a tree, fitted into the waves of the trunk. The leaves spread out over him in points of light, like a string of Christmas decorations pinned up on the sky. When he looked, Mason could see his head bent and his arms clenched around his knees. He wondered what he was doing, what he was feeling, when this would happen. As it turned out, it was only the next week. Once the paint dried and he could run his hand across the wrinkly-smooth surface of it, the moon was hanging heavier in the sky. He drove out to see Alan. When he pulled up to the house and got out of the car, the balance of the light on the trees and the shape of the leaves on the sky was suddenly and differently familiar. In his painting he hadn’t noticed that forest there, but when he saw the trees he could see his own strokes curling up the sides and pressing in the shadows. When he got into the house he knew something was wrong. When it was over and the silence had stretched too long, Mason escaped. He curled and bent like Alan had, like a leaf withering and twisting on the ground in the autumn, like he was trying to fold into himself or wrap around the edge of pain in his throat where he wouldn’t let the tears come. He walked, without thinking, not toward his car. He got to the edge of the trees and listened to the creak of the forest, the chirp of the birds and crickets, the timid crunch of his shoes on the bits of forest carpeting the ground. He nearly walked into a tree. It loomed over him, leaves tipping and straightening in the night breeze like uncertain dancers. Mason knelt and leaned, fit himself against the curve of the tree and nestled into it like a lost lover. He stayed there, huddled against the tree, until he realized that he had painted these moments. A canvas at home was splashed with the colors and the beauty of this heartbreak. He closed his eyes then against the glitter of light on the edges of leaves, the fat yellow moon, the forbidden glow of the windows half-hidden. He has too many words to say and write and think and they’re pressing and building – and he’s so afraid that he’ll forget how to unstopper them and let them spill out and fall, slip sinuous and puddle in a pool that sinks into the soft weave beneath what holds something together, himself or something else. He’s afraid they’ll stay there, and he won’t be able to let them out. He’s afraid to live quietly. He’s afraid of being alone, and he’s afraid that people are alone, and thinking of it makes him slide apart. He’s afraid he’ll forget the words he needs to say before they slip out, before he slides apart or together or holds himself fast with forgotten threads of memory laced with tears and grief and still bound tight. He’s afraid to speak. I said goodbye to you without crying. I left what remained on the sidewalk there with you to be run over, stepped on and kicked aside. There wasn’t much left anyway. Ours was a relationship that crumbled. We held it tight in our sweaty hands, clasped together, but it was seeping slowly through the cracks. We tried to catch it and let it pile again, make a shape, build on our palms. All it did was run over our skin. It was smooth as it dripped and slipped and slid away, it was soft and lovely, and then it was gone. Perhaps, someday, we will find one again. A relationship, a life, something. We will never find those powdery remnants of love that was. Those are lost. Maybe someday we will find a new place, a new way, and it will be something too strong and solid to ever crack. It will never crumble. We will never have to grasp, frantic and falling, at one another to hold it together.